Q: How to design a watermark by myself for my flipping book? When a good designed watermark is in demand, how can we embed a watermark which is designed by ourselves? PDF to flash book maker provides a way for you to realize it easily. Watermarks are sorted into two styles, the one is text file form, and the other is image form. 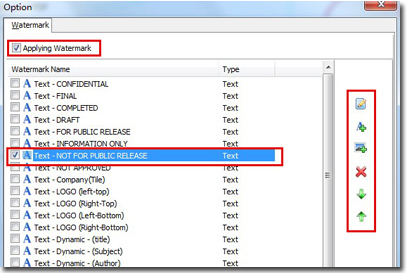 As to the text file form one, you can do as follow steps. Step 2: check “Applying Watermark”, obviously you can add a text watermark directly here by using buttons at right side now. You also can edit an existing watermark with the “Edit Selected Watermark” button too. To make sure the “Edit Selected Watermark” button is available, please confirm that you have selected the watermark which you want to edit at first. Step 3: edit the name, properties, layout, position, etc of the text watermark in the “Add Text Watermark” tab or the “Edit Text Watermark” tab. Step 4: check “Ok” button, another ”Ok” button again, then check ”Import Now” button, thus a watermark importing for flash book is finished. Designing an image watermark, you can also reference to steps as above.